The food of life of the hair. Hair loss is a natural phenomenon that affects many women, since women are three faces at least once in his life. 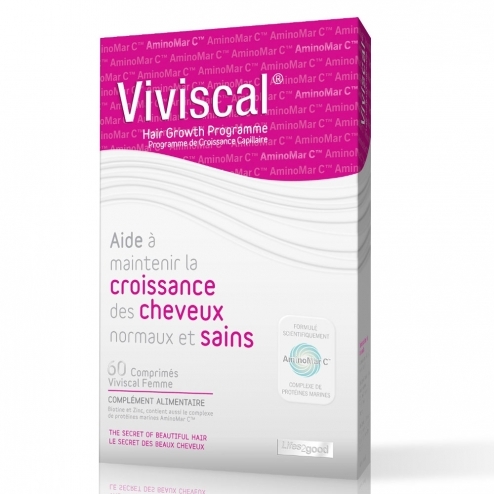 Viviscal Woman - enriched formula is a dietary supplement based on natural ingredients, specifically formulated against hair loss. Viviscal contains complex including marine AminoMar C?? which provides the essential proteins to promote natural regeneration of hair, give them strength and beauty, and revive growth by stimulating the hair bulb. Viviscal � works in 4 stages over a period of 6 months. However, most users will see a difference after 3 or 4 months?? which corresponds to the natural growth cycle of hair. STEP 1 Nourishes the hair follicles. STEP 2 Enhances the growth and the growth of existing hair. STEP 3 Promotes the growth of existing hair where it has slowed down or temporarily stopped. At first, these are thin and fragile hair. STEP 4 Hair becomes stronger, healthier and shinier. Recommended dose: Take 2 tablets per day for at least 6 months or until the expected results (1 tablet in the morning and 1 tablet in the evening with a glass of water after meals). If necessary, continue treatment with 1 to 2 tablets per day. Viviscal tablets are easy to swallow. INCI formula: C AminoMar?? (Excerpts from marine protein) Cherry Extract (Malphigia Glabra L), bulking agent: microcrystalline cellulose, Horsetail Extract (Equisetum Arvense L.), natural flavor Orange, anti-caking agent: magnesium stearate, coating agents: hydroxypropylmethylcellulose, glycerol.